Our latest major release Megaventory 3.0 was launched a while ago and we completely revamped the search tools, so you can easily find what you are looking for. At the upper right corner of every page in the application you can find the search icon where you can search for products by their SKU, Product Description, Product Version or Supplier SKU. Once the results are returned you can either click or hover on a product. 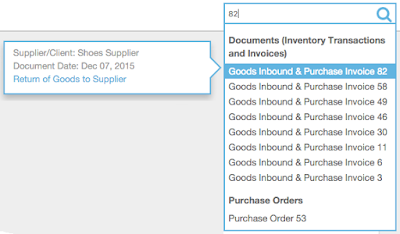 Clicking on a product will open the Edit Product form. This is a good way to avoid having to navigate to the Gear Icon, then to Products, to search for the product and then click to edit it – instead all this is collapsed in a single search and click. 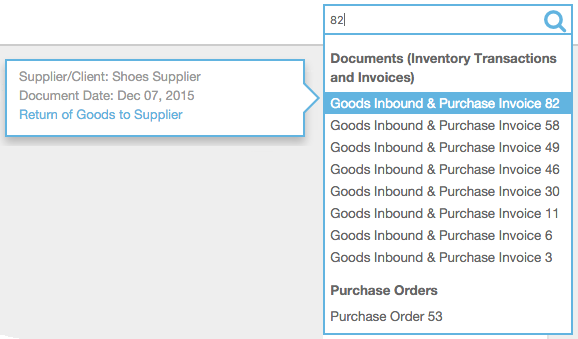 Hovering over a product will display its SKU and will allow you to Trace Inventory Changes for this product. Similarly, this can save you considerable time and clicks to navigate to the right dashboard and retrieve that report from it. Specifically for Goods Inbound/Outbound documents and invoices, you can hover over the document number and issue a Return Document for that particular order right from the Search results. This is considerably faster than the usual process of navigating to the relevant dashboard doing a Return of Goods action and making the right choices in the drop down menus there. Another way to search within Megaventory is to open one of your cards (such as Purchase Order, Sales Order or Work Order) and click on the search icon right above the list. This is a quick way to find orders which include a specific product code – the search will try to match your term with either the SKU, the Product Description or the EAN of the products. 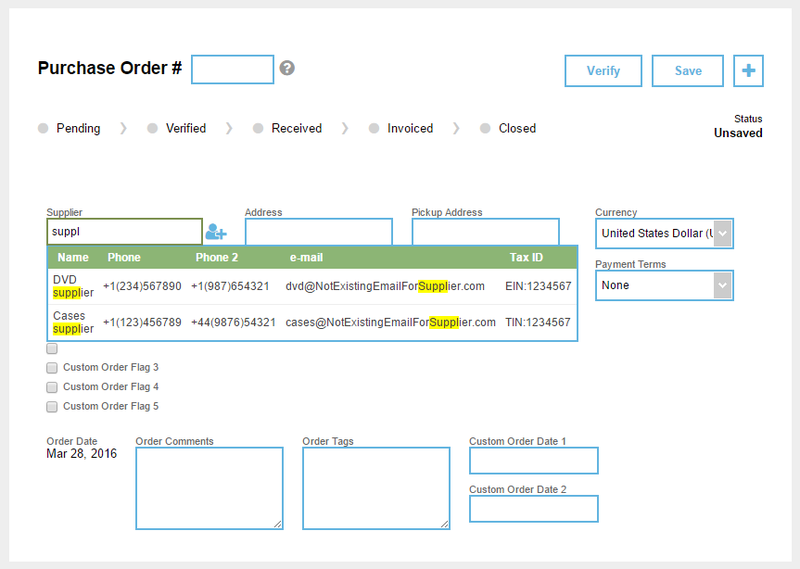 While editing a Purchase Order or a Sales Order (or the equivalent Inbound and Outbound documents) you can search for a supplier or client respectively by typing his registered name, phone, e-mail or Tax ID. 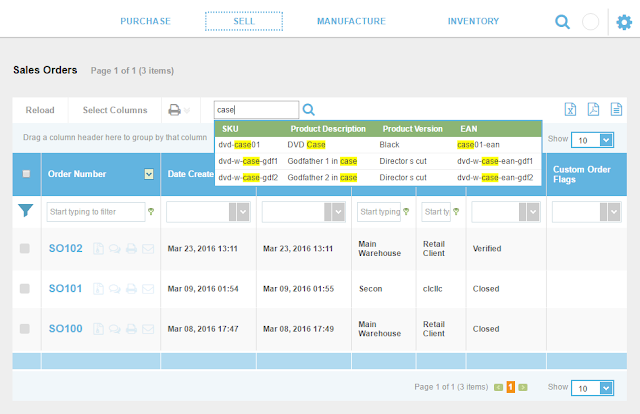 Similarly, when adding products in your order, you can search for a specific item. Both these capabilities can used to speed up your everyday work after you’ve setup Megaventory. Given your familiarity with your product base and your clients and vendors you can quickly process orders by typing a few characters from the supplier name and the product name and have an order ready in minutes – if not seconds. This is an overview of the search functionality available in Megaventory – it’s all been designed to help you be faster and error-free in your everyday work. Feel free to let us know in the comments how we can further improve upon it.